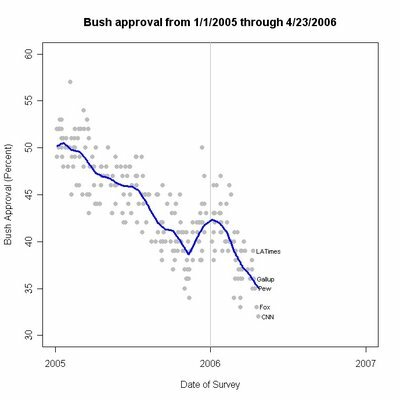 The new CNN/Opinion Research Corporation (no longer Gallup) poll taken 4/21-23/06 finds approval of President Bush has slumped to another new low, this time 32% approval and 60% disapproval. There is also a rather large "Don't know" rate of 8%. (The median DK rate in 2006 across all polls has been 4%, though 17% of 2006 polls prior to this one have seen DK at 8% or higher (11 of 63 polls). This result is similar to Fox's recent result of 33% in a poll completed 4/19, though both are a bit below recent Pew and Gallup results of 35 and 36% respectively, and well below the LATimes/Bloomberg rating of 39% from their 4/8-11 polls. CNN reports that ARG found 34% approval in a poll completed last "Tuesday through Friday". Based on the new data, my trend estimate is now at 35.05, down from 35.9. When the Fox poll arrived, I said here that I expected it would prove a bit low and that based on the model, approval around 35% was more likely in upcoming polls. While Pew is at that level, the Fox and ARG results are below it and the new CNN is even more below. There is still reason to think that approval is "really" about 35% (the "reason" is my trend estimate!) but there is also room to wonder if Fox and CNN are harbingers of a new sharp dip in approval rating. There is also an important caution. This is the first CNN poll conducted by Opinion Research Corporation. CNN and Gallup ended their relationship last month (Gallup's last CNN poll was 3/10-12). [MysteryPollster Mark Blumenthal has an excellent discussion of this here.] ORC is a well established polling organization but we do not have a public track record for their presidential approval results. Their "house effect" is therefore completely unknown. It may be they tend to get approval numbers that are higher, lower or about average compared to other polling organizations, we simply don't know. Until they produce a number of approval polls, we won't be able to say much about this. Yet that fact is critically important to know before we make too much of the 32% result in this latest poll. If they have an "average" house effect, then this is bad news. If they have an above average effect, then this is terrible news for the White House because others will be even lower. But if they tend to under-state approval, then other polls will probably come in higher. The gap between my 35% estimate and their 32% is (just) within the margin of error for the CNN poll, so it doesn't fall outside a reasonable range of the trend. "How would you describe your personal views? Are you...Republican, Democrat, or Independent?" It would appear from the 11% DK and other that they don't push respondents to choose a partisan category, which many surveys do. Those results would put ORC close to NBC/Wall Street Journal in terms of finding lower percentages of both partisan camps than most polls. The equality between Republicans and Democrats also makes ORC a little unusual since the large majority of polls in 2005 and 2006 have found a small Democratic advantage over Republican identification. See here for all the details of party id across polls. As I showed in this earlier post, modest variation in party id does not have a huge effect on approval ratings, certainly not as large as seems commonly believed. Further, we only have this single ORC poll in 2005 as a point of comparison, so it is important not to make too much of this. When ORC has completed a dozen or so polls for CNN we should have a good statistical handle on what their house effects look like in comparison with other organizations. But do let me rant briefly. CNN has changed polling houses. 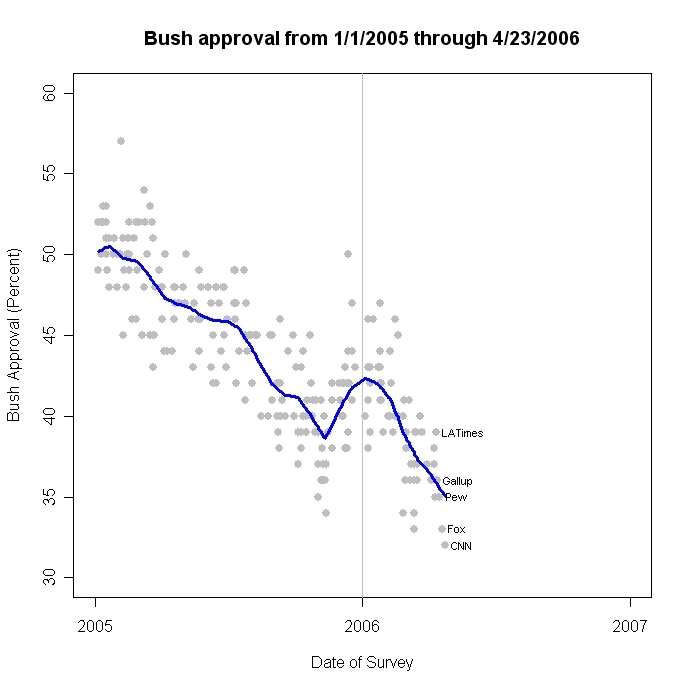 Yet their web site posts comparisons with past Gallup polls (see here.) How can we compare ORC with Gallup if more information is not provided? I was able to find only ONE previous ORC party ID result from the past 16 months (and that using the Roper Center's subscription only service.) As I said above that question wording is a bit unusual. What PID wording is used for CNN? Is it the same or different? They don't say and don't provide the results. It is inexcusable that CNN refuses to post the demographic and especially partisan breakdowns of their polls. While they deserve some commendation for including the topline results of their topical questions, they need to follow the lead of other reputable polling organizations and provide us with the full demographic breakdowns as well. It costs nothing and it enhances credibility. It would also allow some assessment of how ORC compares with Gallup and with other organizations. If CNN's business is information, they should be concerned to provide enough of it for resonable understanding of their results.